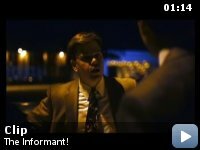 Taglines: matt damon is The Informant! Errors in geography: In the scene when they supposedly are in Mexico, the pay phone model reveals they are actually at some Aeromexico lounge in the US. Mark Whitacre: [voiceover] You know that orange juice you have every morning? You know what's in that? Corn. And you know what's in the maple syrup you put on your pancakes? You know what makes it taste so good? Corn. And when you're good and help with the trash, you know what makes the big, green bags biodegradable? Mark Whitacre: [to his son] Do you? Mark Whitacre: Corn *starch*. But Daddy's company didn't come up with that one. DuPont did. 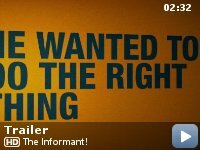 At its core, The Informant! is, by no means, an inherently funny story. It involves international corporate conspiracies, corruption, deception and betrayal. 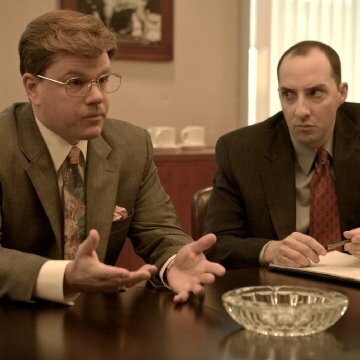 Yet somehow, Steven Soderbergh manages to turn Kurt Eichenwald's book, which depicts the true story of former ADM employee Mark Whitacre in the manner of John Grisham's best legal thrillers, into a thoroughly entertaining, often very funny movie. 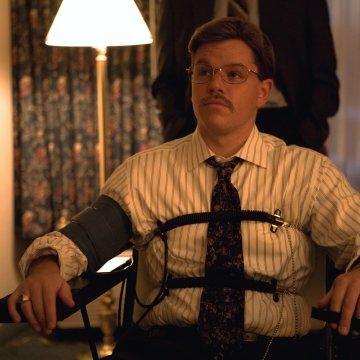 This, of course, is aided by Matt Damon's brilliant, spot-on portrayal of the corporate executive-turned-FBI informant, as well as solid work by the supporting cast. When I first read Eichenwald's book after learning about this movie, I was slightly skeptical. Economics and law are far from my forte. However, what I found was a story so ridiculous and told in such a compelling way that it was difficult to put the book down. Especially for a nonfiction story, the characters felt so well-developed and so three-dimensional that you cannot help but care immensely about them, despite their flaws. And then, I heard that Soderbergh planned to make the movie version into a dark comedy. Given some of the subject matter and material involved, I was worried that the film would turn into too much of a farce and would not give the real-life story and people the proper respect. To my utter relief, I was wrong. While some of the darker elements have been left out and the film is undoubtedly lighter than its source material, Soderbergh stayed true to reality, keeping the events mostly accurate to what Eichenwald described in his book, and hence, to what really happened; in fact, on a side note, after seeing the movie, the real-life Mark Whitacre commented that the film was "very accurate", which is a bit of a surprise considering Soderbergh made the decision to not consult any of the people involved in the actual 1990s investigation. Oddly enough, while this probably sounds contradictory to the opening statement of my review, much of the humor actually springs out of the events and dialogue depicted in the book, almost all of which took place in reality, rather than jokes or quips written by the screenwriter or improvised by the director or actors. There are so many hidden layers to the tale that, in retrospect, it is hard to not laugh or at least gap in wonder at how it all unfolded. Of course, that is not to say that Scott Z. Burns, who adapted Einchenwald's book for the screen, did not do any work. The screenplay does an admirable job of adhering to the true events with enough creativity, wit and originality to prevent the film from seeming like just a retread of everything Einchenwald accomplished in his narrative. Also impressive is the cast. 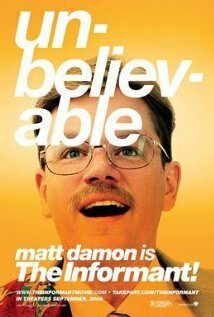 Naturally, as Mark Whitacre, Matt Damon stands out. Even though he had not met the person he was portraying before filming, he perfectly captures Whitacre's personality, mannerisms and attitude, making him seem larger-than-life but at the same time, completely and utterly human, while many other actors might have made him too much of a caricature. The supporting cast does a fine job as well and perhaps the most noteworthy of these actors are Scott Bakula as the benignly professional FBI agent Brian Shepard and Melanie Lynskey, who portrays Whitacre's devoted wife, Ginger, with a sort of Mid-western bubbliness. In typical Steven Soderbergh mode, the director adds a quirky, unique tone to the movie. 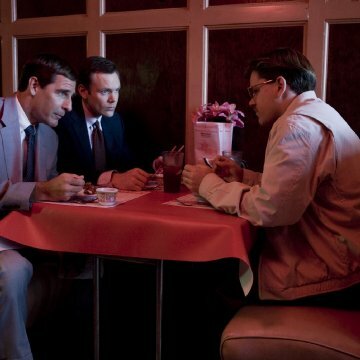 Although the whimsical, almost cartoonish score is sometimes a bit intrusive, this quaint style effectively mirrors the film's subtle and often ironic humor, and instead of being distracting, the cinematography, complete with the intense lighting and vibrant colors that make Soderbergh's films so distinctly his, helps emphasize the movie's off-beat wackiness. From the opening credits, viewers are immersed in the simple, charming vibe of small-town Illinois; this ambiance is benefited by the fact that Soderbergh chose to film in Decatur, the very town in which the real-life events occurred. Everything feels authentic, from the hairstyles to the ADM office and even the colorful array of ties sported by various cast members throughout the movie. Furthermore, by using voice-over narration, Soderbergh effectively manages to enter the mind of Mark Whitacre, who is, to say the least, an extremely fascinating personality. 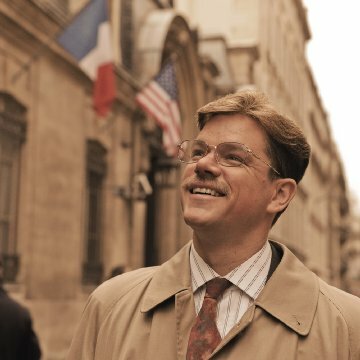 Partly thanks to Matt Damon's nuanced performance, the audience learns to sympathize with - if not root for - Mark, regardless of his moral ambiguity and questionable decisions. Perhaps, more than anything else, this is because the movie never makes fun of him, only at his nearly unbelievable situation. Not once is he made out to be a completely villainous guy or a complete hero; he is merely human.